I present the above study to justify use of 18 AWG wires as home run from each low-power luminaire, to a central distribution control panel. 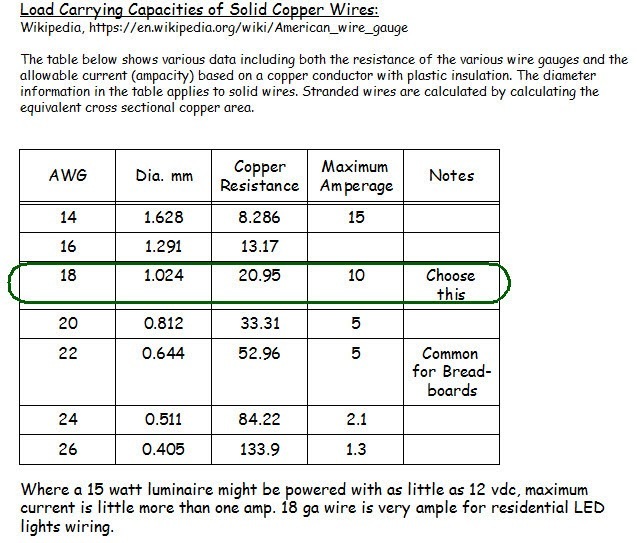 18 AWG may carry up to 16 amps, compared to actual 1 amp with luminaires 15 watts and less. 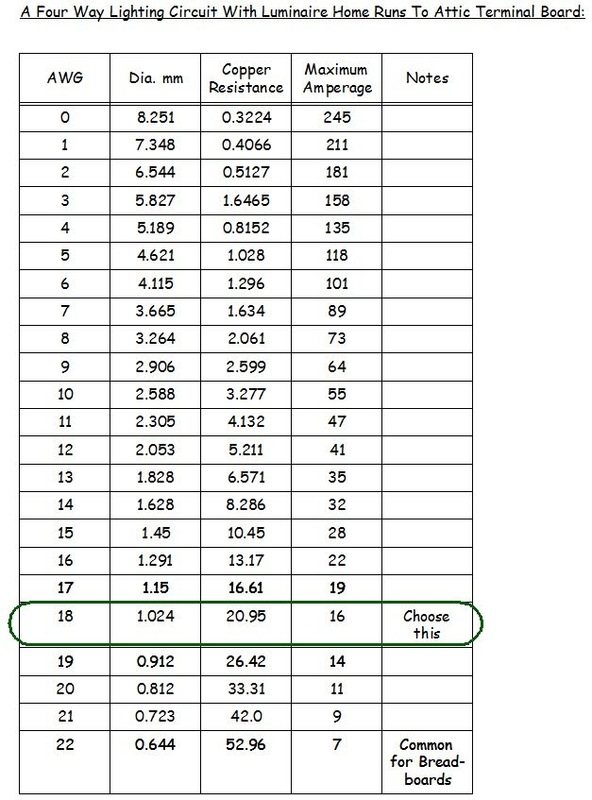 15 watts divided by 12 volts minimum (DC), is about one amp. Home run wiring, none powering more than one luminaire, offers advantage of smaller, more-flexible, less expensive wires, and freedom to place any light in a constellation of lights operated together from a switch (single pole), or from a switch set (3-way and 4-way switching). See that current carried will be acceptable with home-runs, even with tiny 24 ga ethernet wires from a luminaire as in Power Over Ethernet (POE) lighting. 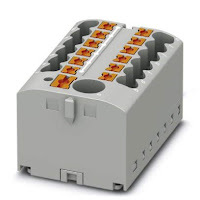 22 ga leadwires of short length immediately connected to a luminaire may serve tiny connectors as assembled easily by children in robotics projects. We should hereafter see little need of 14 ga romex, the past usual call in residential lights wiring. This post is continuing discussion of refined kitchen and outdoor LED lighting in my own home. My Kitchen LED Starry Sky With Constellations . Protected and out of sight in the attic, the lights wiring is little improved from this photo of September. 2018. Please come to accept that evolving low power,LED and OLED lighting (10 watts typical to each luminaire) will employ a mix of wire sizes 14 ga and smaller, and will allow central conversion from AC house power or direct delivery of photovoltaic output, to luminaires and to other DC loads. In fact, I have so far exercised only low power wiring, where 18 ga wires are placed. 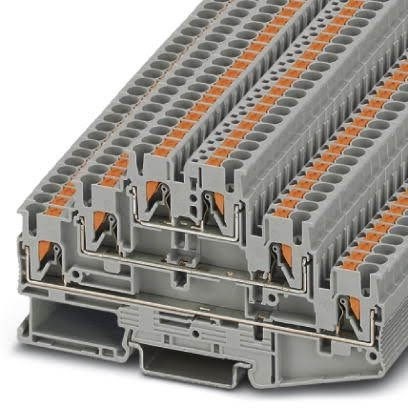 The home run 18 ga wires are collected at terminal blocks with push-in of bared single strand copper wire ends. The blocks are built by Phoenix Contact .and were found at Portland, Oregon store URS Electronics . Terminal blocks first tried are configured for adhesive mounting, Phoenix ID 3273352 . 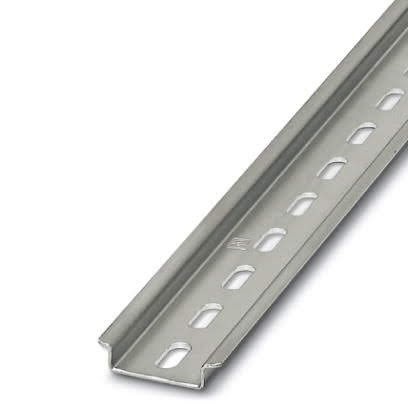 Employ an 8" length of DIN Rail. And, now think of better choices available. This is Phoenix ID 3273220 . With a three-level block for each set of lights served by a jacketed home run may be labeled upon its sleeve, with power, neutral and ground leads of short length extending from sleeve. Where wiring might someday be low voltage, persist in avoiding use of ground wires. then using two-level terminal blocks. 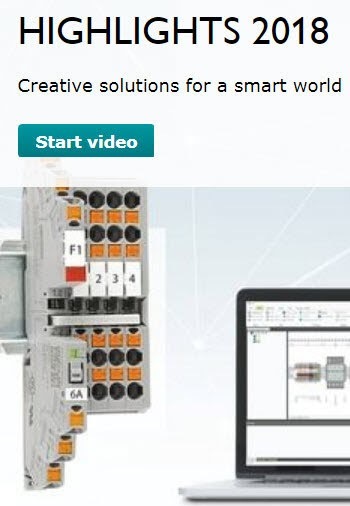 Watch a Phoenix Connect innovations video. Highlights 2018 . The topics are electronics/ digital connections that already are possible. Let us imagine details of our better lighting future, to be offered from many suppliers and installation innovators. Let us imagine lighting as involving many electronics suppliers like my Oregon store URS Electronics , and fewer old-bulb-selling hardware stores. Here is my attic arrangement of kitchen lights wiring, slightly improved with DIN Rail Adapters. Here is an assembly of two-level terminal blocks Phoenix 3044636 with plug-in bridges, three-position Phoenix 3030174 and four-position, Phoenix 3030187. Trial mounting is upon a new 8" length of DIN rail with two rail accessories set that I may not use, Phoenix E/NS35N Rail End Clamp, and Phoenix 1206560 Cut Rail End Cap. Bridges at lower level establish common switched output to two 5-luminaire constellations, one 6-luminaire constellation and two home runs from outdoor lights on one switch. Bridges at upper level common all neutral wires. Why consider the Rail End Clamp? Let it wedge an insulating cover of otherwise exposed power conductors. The two-level terminal blocks have strong fit as a cluster, and do not need further restraint. A coil of 0.511" Corrugated Split Loom Tubing is at the ready for neat confinement of 18 ga and 14 ga cables leading to the cluster. Where luminaire leads must approach both sides of the DIN rail here. place the rail upon stand-offs so that leads may pass under. 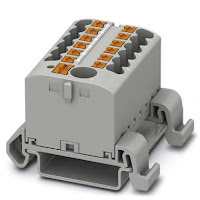 Here see Phoenix 3044636 Two level Terminal Block, Phoenix 3214259 ($2.50 each), Three Level Terminal Block ($4.50 each), E/NS35N DIN Rail End Clamp, and Phoenix 1206560 Cut Rail End Cap. These parts are offered only in Color Gray. See that conducting metal is exposed at one end of a block cluster, and that the end clamp tried can not cover the adjacent conductors. I imagine there are available end caps for the two-level and 3-level terminal blocks. End caps will never be needed at both ends of a cluster; the covering must be the purpose. The three-level block would be useful where conductors carried to luminaires include ground wires. I have ground wires in my luminaire 18 ga cables, not connected at luminaires. Someone will say that I should attach the ground wires, where they carry 110 vac. I believe wiring innovation as tried here, is inevitable in most homes.OLED must replace all antique lighting, when it it soon becomes a consumer product of modest cost. We are done with CFL as the hope for our future of ample affordable electric light. Ordinary LEDs have never been consistently embraced and loved, and will experience less than expected service life due to breakdown of materials at least where running hot, then drifting quickly in output color . Many LEDs cheaply built with awkward conversion from AC power will need replacement, never repair. We should then be building with lighting always that is forward-compatible with OLED. I believe there are responsible people, as at US Department of Energy, who should be advising what wiring forward-compatibility consists of. 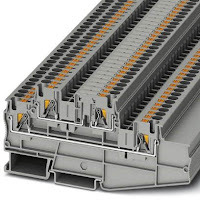 Manufacturers of cables, switches, dimmers, power converters and connection panels, should already be engaged in the innovation. I offer to be a beta tester and reporter. These are some of the very useful tips given.Heating and Cooling Richmond Hill A furnace must be maintained overtime.